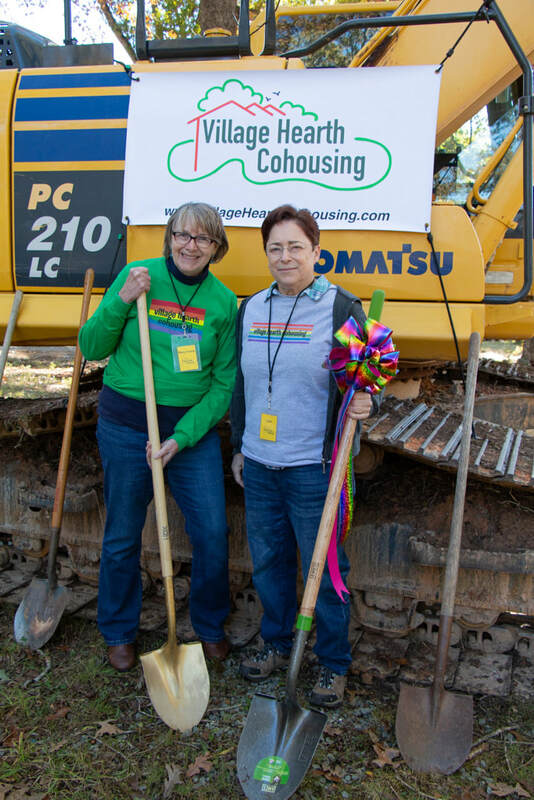 On October 29, 2018 Village Hearth Cohousing took a huge step forward. It’s been a long road. 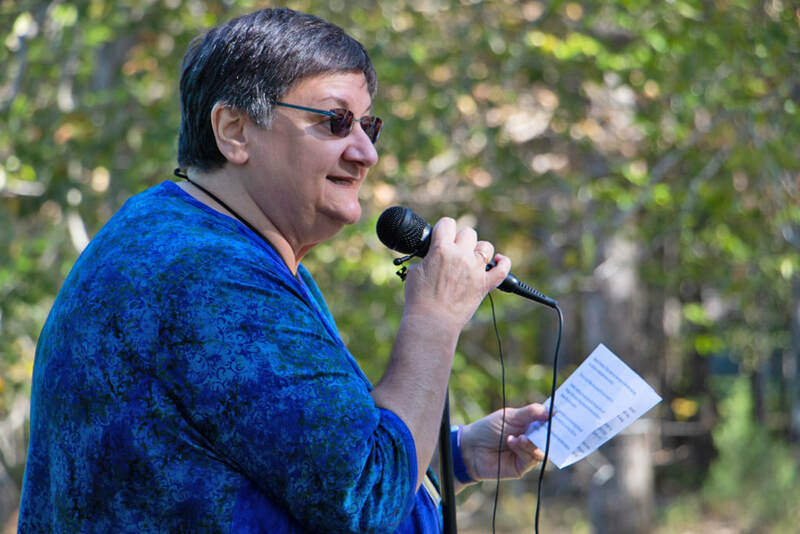 Starting in early 2015, after researching options for living a great life in retirement, Pat and Margaret put out the word that they wanted to build an LGBT-focused community welcoming straight friends, and allies where they could proactively direct their futures and be themselves in a mutually supportive environment. 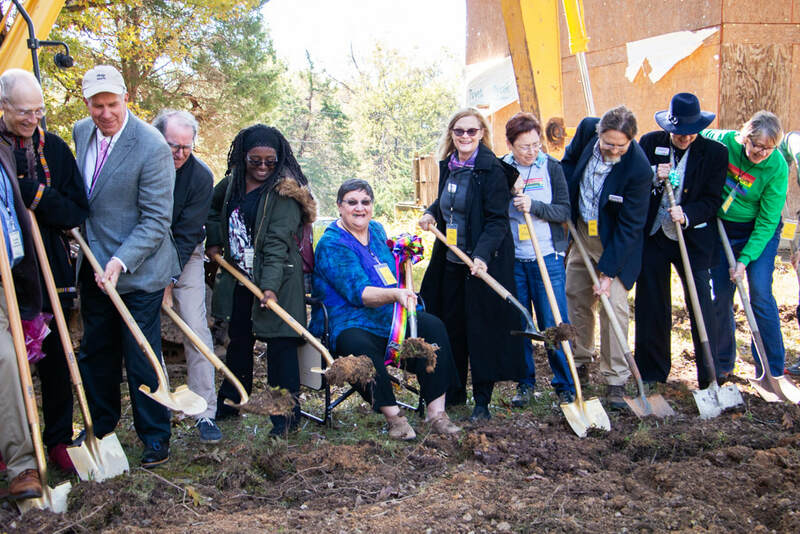 They hired Katie McCamant, president and development consultant at CoHousing Solutions, to guide the development process, and we're so grateful they did! 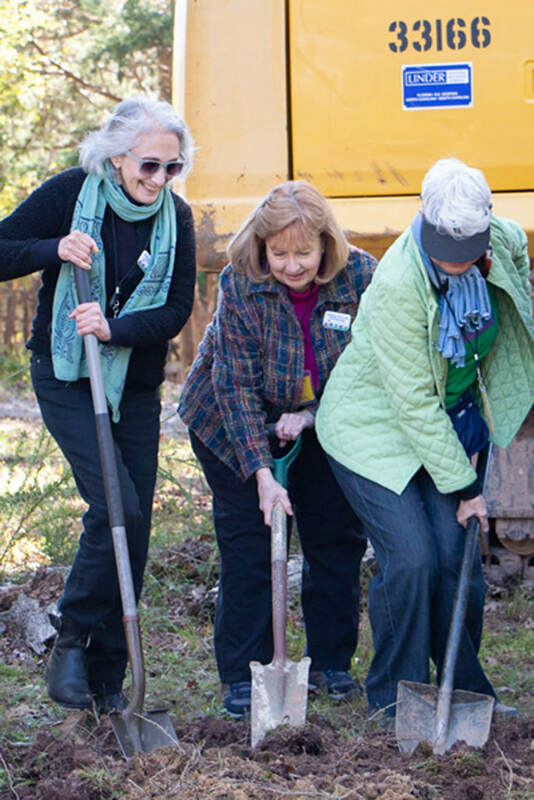 Margaret, Pat and friends considered 275 properties before finding and purchasing the perfect 15-acre plot of land in north Durham, NC. A few bold early-joiners later and we were off! People begin to gather for the groundbreaking ceremony. 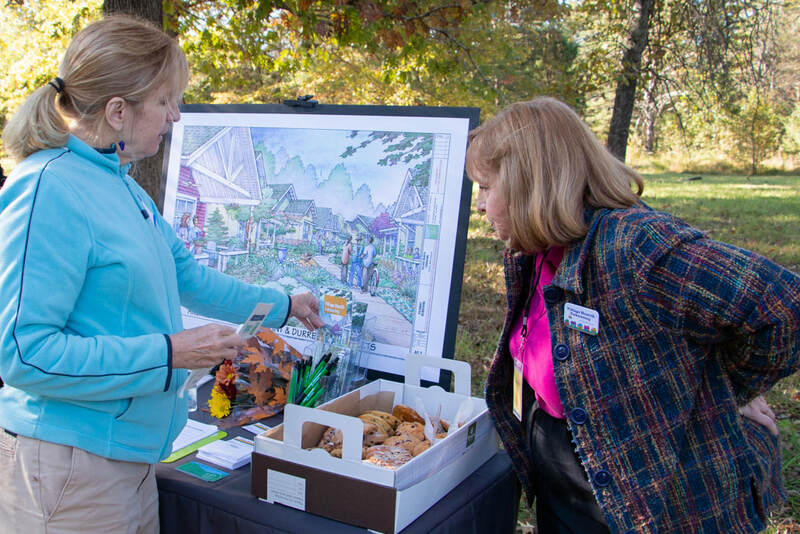 Debbie shows a guest an artist's rendering of our future community. Gary, Patricia, and Dona enjoyed the crisp fall weather. Julia talks with Lou, Allan spots the camera, and Christopher looks on. There have been so many steps along the way and so much to learn. Coulter Jewel Thames Civil Engineers have been invaluable in guiding us through the governmental requirements of rezoning, annexation, site planning, permitting, erosion control and more. 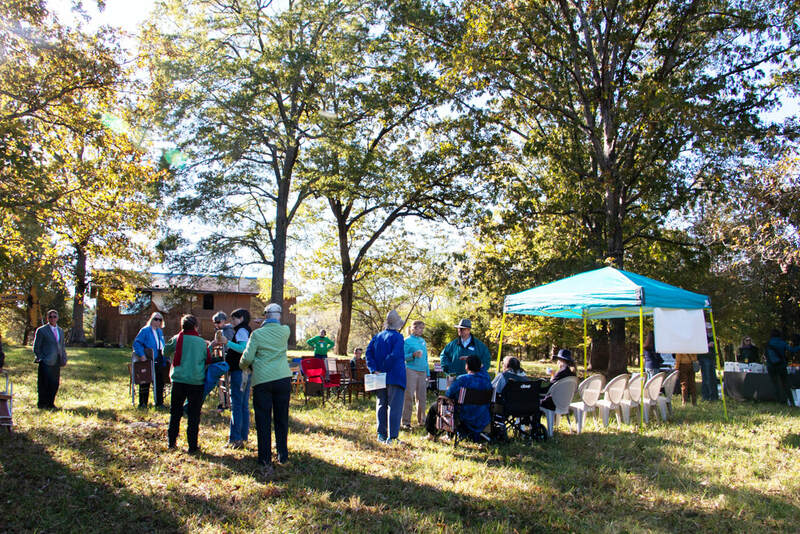 An expert in creating spaces that nurture community, Chuck Durrett of McCamant & Durrett Architects led us through a series of workshops that yielded a tight pedestrian-friendly site plan, an inviting and multi-purpose Common House, and cozy energy-efficient private homes. Chuck prompted deep thought about our priorities and helped us with some tough choices. Durham City Council unanimously approved our plans, saying they were pleased that we chose to bring another cohousing community to Durham! 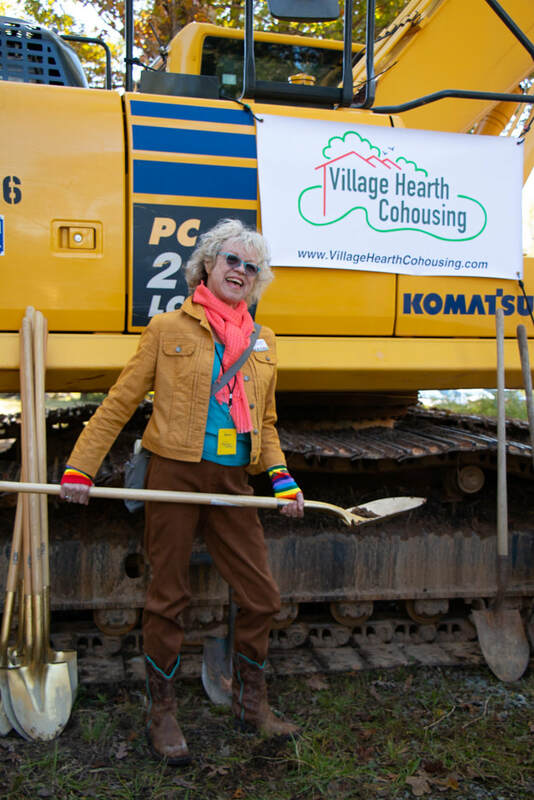 Jillian Johnson, mayor pro-tempore, hopes to live in cohousing some day. 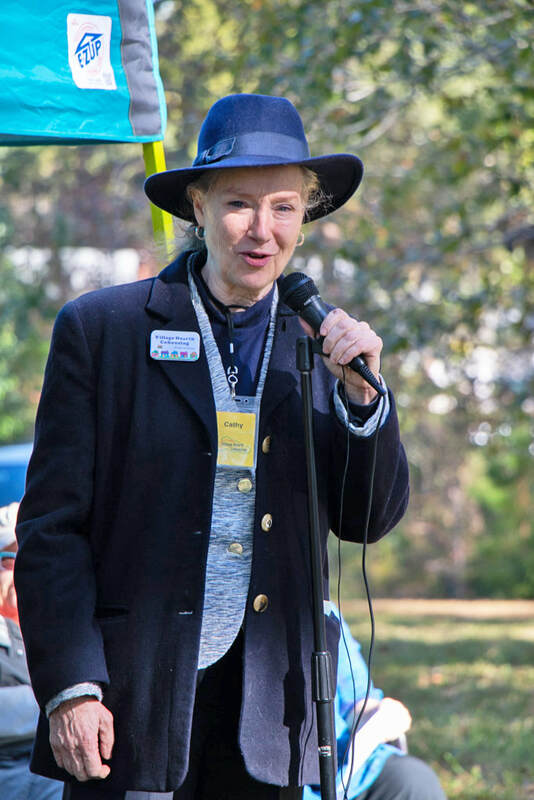 Pat Harris, Durham architect, Friend of the Hearth, and cheerleader for cohousing, shared stories with the crowd. Member Patricia and Friends of the Hearth Doris and Mindy enjoyed the speeches. ​After gradually adding members, we hit the proverbial "tipping point." We've grown rapidly this year to 24 member households out of the 28 we are building. 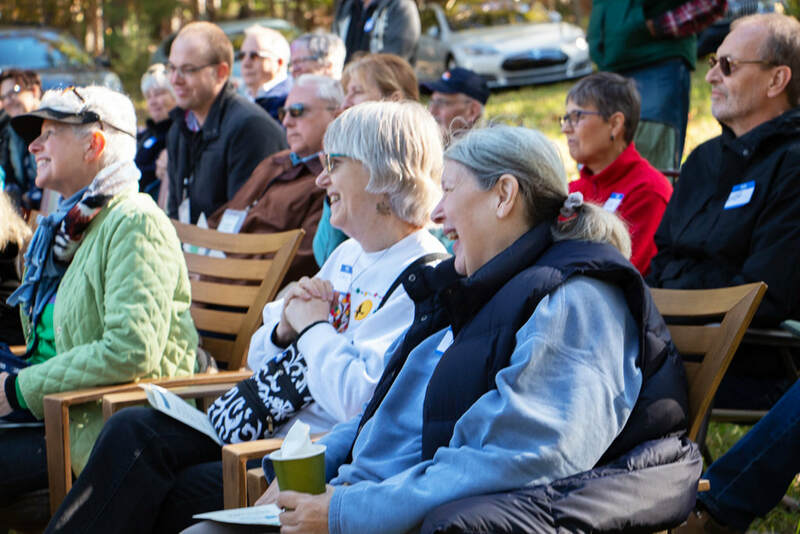 Some are local to the Triangle and nearby Greensboro, but we are also gathering future neighbors from Asheville, Virginia, Georgia, New York, Kentucky, California, Massachusetts, Texas, and Maine! It's been like the pieces of a puzzle coming together, and each new member fits exactly where they're placed. 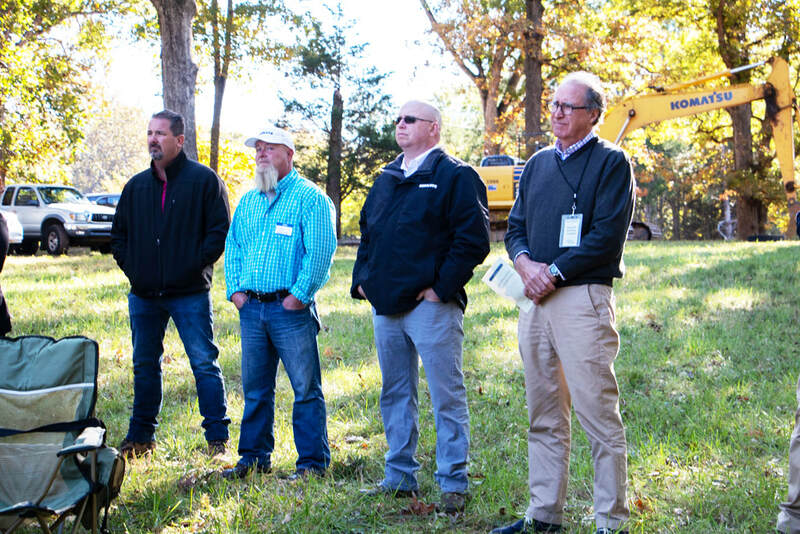 We partnered with Lou Goetz, Park City Developments, who has been working with us on finalizing our development plans and connecting us with the right people and companies, including locally-respected Resolute Building Company. 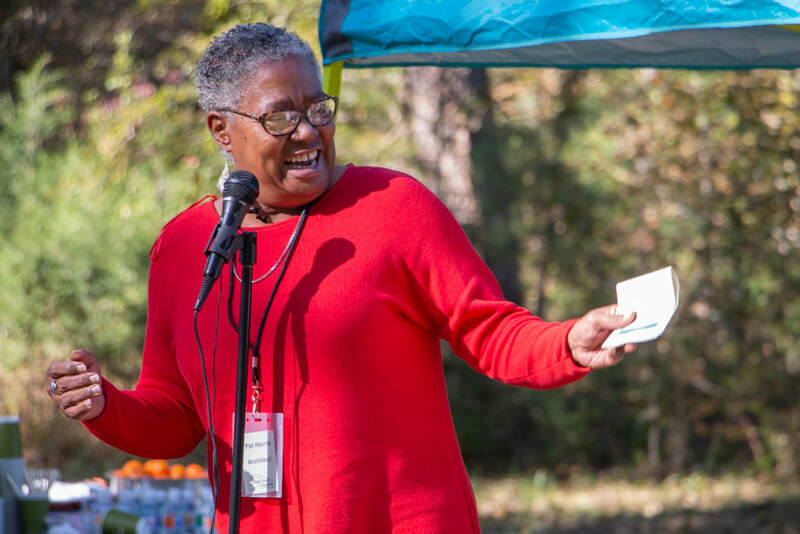 Co-founder Pat said we would be glad she used notes because she can talk cohousing for hours. Dan Jewell, Coulter Jewell Thames, says a few words. 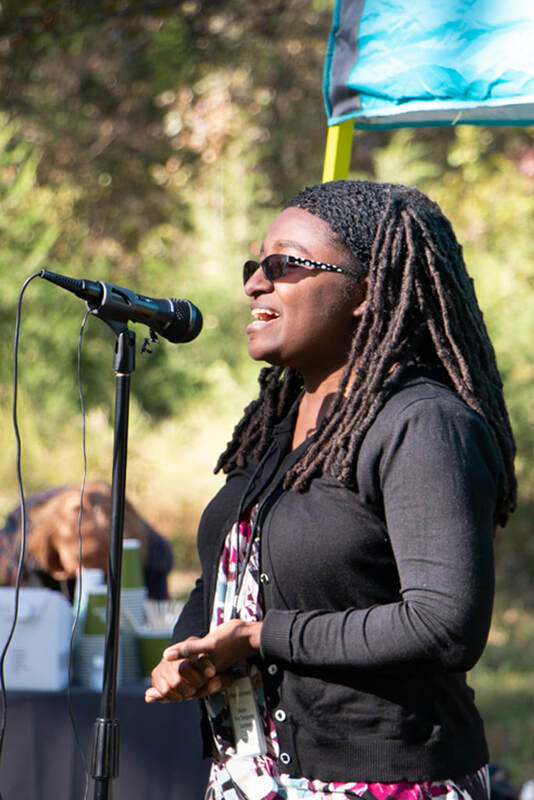 Lou, our development partner, is enthusiastic about the future of cohousing. 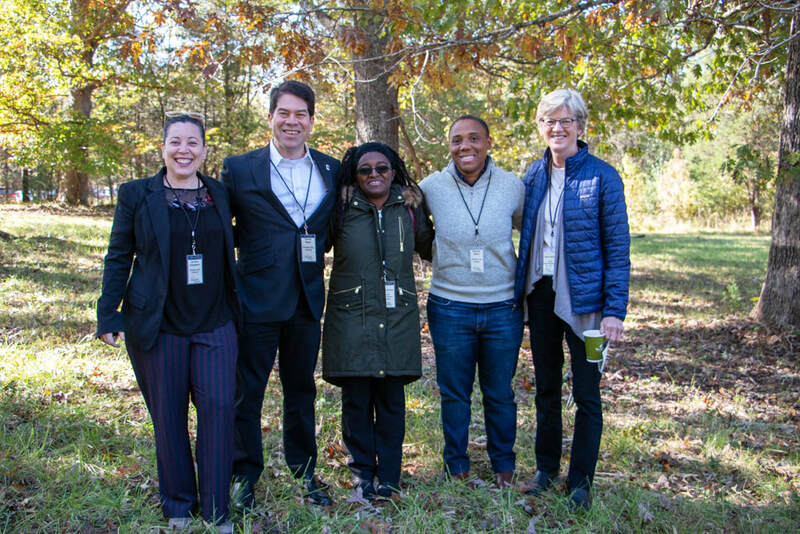 We were pleased to have some of our city and state officials attend, Javiera Caballero and Charlie Reece (Durham City Council members), Jillian Johnson (Durham Major Pro-tempore), Vernetta Alston (City Council), and Marcia Morey, our state representative. On August 28, three years from the day of land purchase, we each selected our actual units, so now we know who our neighbors will be! While working to make the physical community happen, we are also getting to know each other, learning how to govern ourselves together, and building bonds of friendship. ​We were also happy to have several representatives attend from Resolute Building Company. 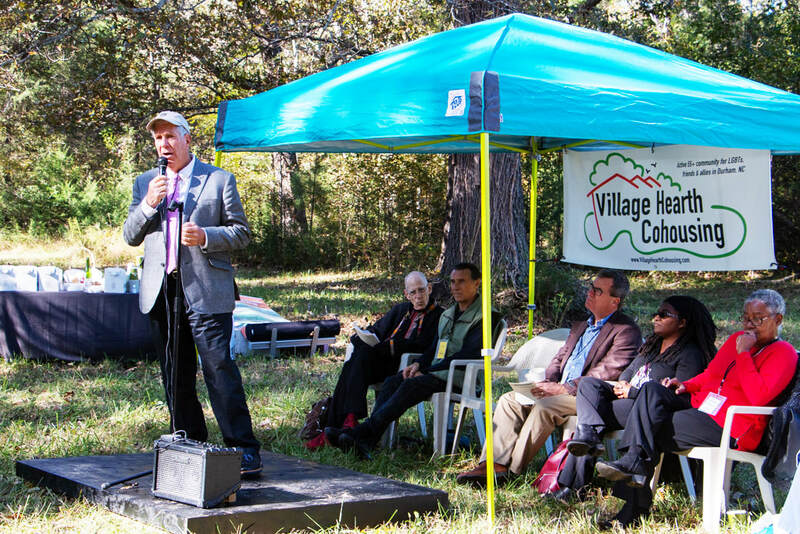 Their excellent reputation and the detailed planning they have done with our development committee give us confidence that Village Hearth will be built right. And they brought us a backhoe. It's really big. Our resolute guys from Resolute Building Company. The backhoe with shovels ready for digging. I said it was big. ​Then it was time to dig in. 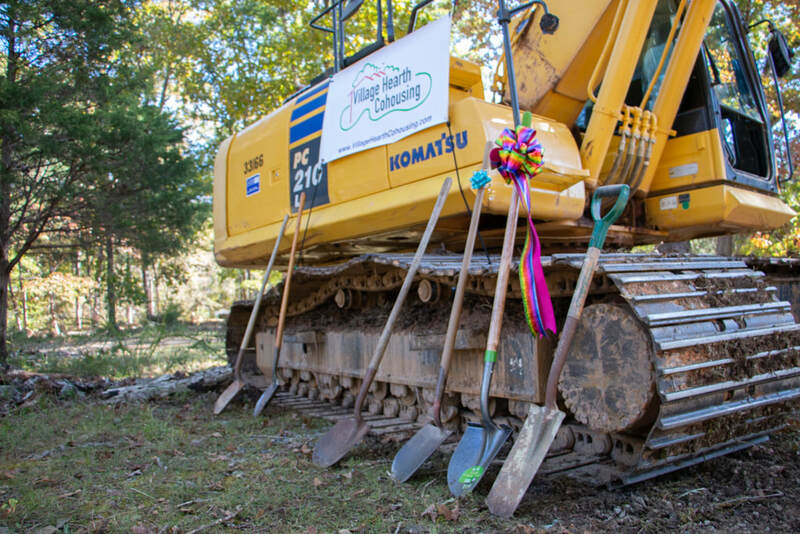 We grabbed shovels, lined up in front of the backhoe, and turned over the first ceremonial shovel-fulls. 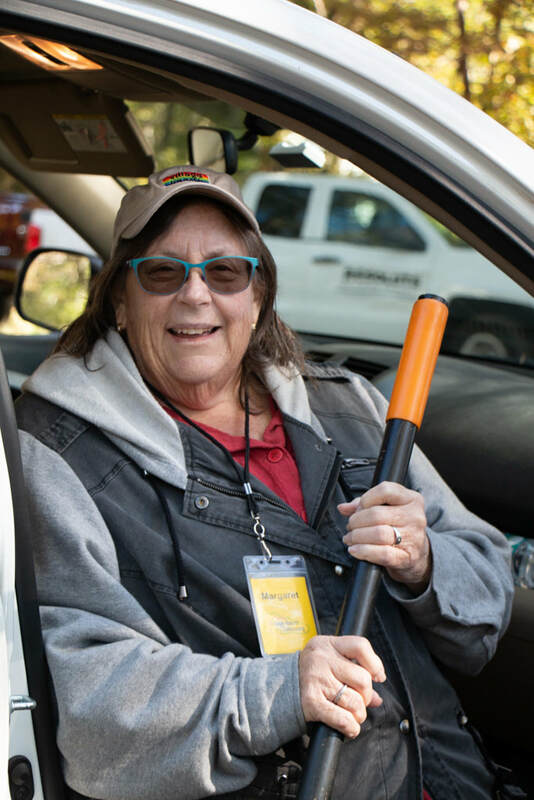 This was a very happy day for co-founder Margaret. Mary and Lisa are ready. It was an emotional event for all of us who had worked so hard. 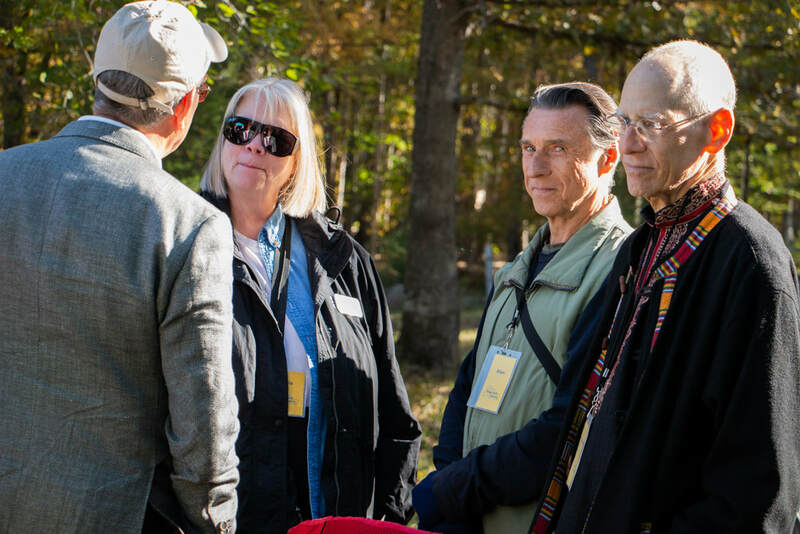 We enjoyed visiting with some of our out-of-town members over the weekend. The day after, Resolute, our building company started preparations - protecting trees that would be close to the site work and preventing erosion. Actual earth-moving started November 9. Now that construction is underway we need to stay out of the way of the professionals. Monthly site visits will let us see what's happening. It will be so exciting to see those snapshots of progress. ​We look forward to moving into our new homes between late 2019 and early 2020. 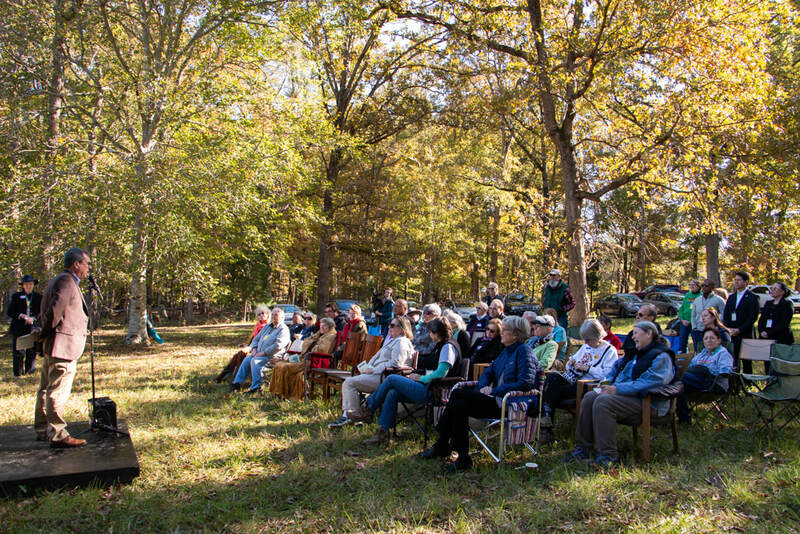 There is still plenty to do in the meantime – developing our processes, learning about sociocracy, downsizing, and, for many of us, selling our homes and moving to Durham. Move-in will be here before we know it. The end of a joyful gathering. The derelict building in the background is on the northern edge of our construction zone and will soon be gone to be replaced with a wonderful new community. 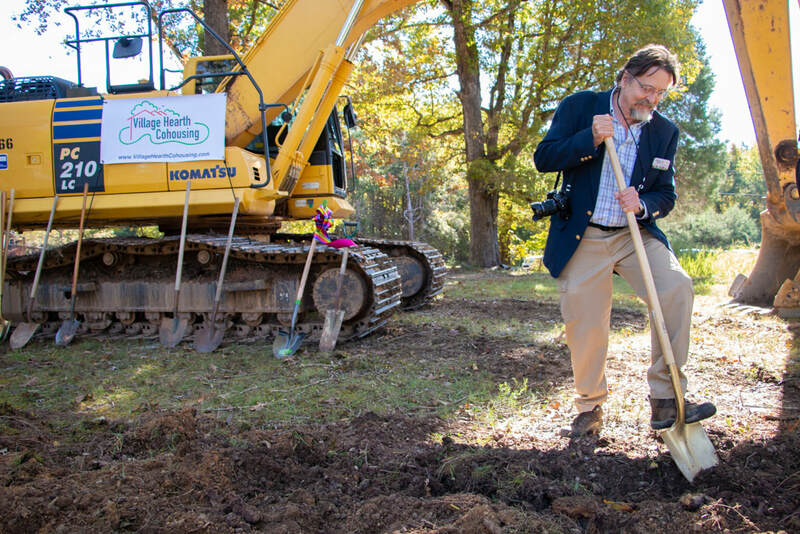 But the beautiful meadow surrounded by oak trees where the ceremony was held is being preserved as part of 10 acres that will be left natural. Many thanks to the friends and supporters who helped and cheered us on our journey. And much love to the intrepid souls who took the leap of faith to be part of the community.